Prior to Saturday night’s concert of the Montreal Symphony Orchestra (OSM), Maestro Nagano humorously warned certain members of the audience they might want to block their ears as the OSM’s brass section had been augmented by 12 additional trumpets distributed in the balconies at the sides of and behind the stage. He also mentioned that the first piece to be performed, Leoš Janáček’s Sinfonietta, had not been played by the orchestra for quite some time. It is a pity this work has not been heard more often. As mentioned in the program notes, Janáček drew his inspiration from a military-style fanfare he had heard in a park in Brno, and the work was offered to celebrate Czech independence gained following the end of WWI. The OSM gave a stirring performance whose detail and clarity blended perfectly with the numerous trumpets. All five of the brief movements showed the orchestra at its best, including the rousing conclusion. Next on our musical journey was a trip to Vienna to hear the celebrated Brazilian-born pianist Nelson Freire as soloist in the Piano Concerto No 20 of Mozart. Given the stirring nature of the Janáček piece, one might have thought programming Mozart next was a risky choice. After all, with the current vogue of “historical authenticity”, Mozart can sometimes sound as exciting as reading aloud the periodic table of the elements. Happily this was not to be the case. From the urgent notes of the opening allegro through its second movement Romance and the wonderful coda of the third movement, the orchestra and soloist worked together in perfect harmony characterized by beauty and emotion. A warm applause from the audience was well-earned. It is interesting to note that in February 2012, Mr Nagano led the OSM in a memorable concert of Mozart’s Symphony No 25 and of the Requiem, both of which were written in a minor key. Does the fact that this piano concerto was also written in a minor key help explain the emotional punch of the OSM performances? An interesting question to ponder. After the intermission, it was off to the USA with the New World Symphony of Antonín Dvořák which he composed in 1893 based on his musical observations gained touring that country. This is one of the most famous of all symphonies and has been recorded and played so often by so many orchestras (not to mention the Largo movement’s popularization as music for the song Goin’ Home) that it almost suffers from the Beethoven’s Fifth effect. Are we concertgoers hearing the live orchestra playing before us or are we really listening to our memory of the piece? Even though many in the audience might have known what was coming next during the Dvořák, the way in which Mr Nagano and the musicians presented it left one awestruck. Each one of the four movements was a gem. My highlight was not the numerous and powerful crescendos, as stirring was they were, but Mr Nagano’s very effective use of two rests during a passage when only the front bench string members were playing. These two pauses of total silence in the hall were very impressive. This New World Symphony provided concertgoers with a whole new aural memory to treasure. A symphonic encore is a rare event with the OSM, and we were treated to the orchestral part of the grand march in Verdi’s Aida. The 12 additional trumpets played once again from their perches joining in as the whole orchestra gave a virtuoso rendition of this showpiece. It was a dazzling end to a most enjoyable evening. As the OSM winds down its first season in its new musical home, the Maison symphonique, it is hard to believe that 10 years have passed since Charles Dutoit tendered his resignation as Music Director on 11 April 2002. During Mr Dutoit’s 24-season leadership, the OSM gained widespread international respect but principally in one style of music, that of French composers such as Ravel and Debussy. When Kent Nagano took over as Music Director in 2006, he announced his intention to continue this OSM’s tradition of excellence, yet broaden its repertoire and as well as playing works which it had performed only occasionally in the past, or not at all. Judging by the current season including this latest concert featuring familiar and not too familiar works of non-French composers, we can safely say “mission accomplished”. With its high level of musicianship clearly entrenched in a more expansive repertoire, we cannot wait to see and hear what the OSM has in store for subscribers next season. Photo credit: Stephen Fogarty, © 2012. 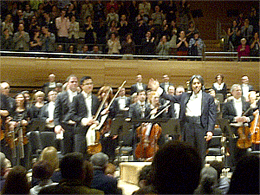 Maestro Kent Nagano and the OSM receive audience applause following their concert in Montreal on 5/5/2012.